You get fat if you eat too much. If nuclear weapons are employed in a world war, the world will be destroyed. The world will be destroyed if nuclear weapons are employed in a world war. if we are not back by midnight, we will miss the chance. We will miss the chance if we are not back by midnight. If I have enough time tomorrow, I’ll come and see you. I will come and see you if I have time tomorrow. If she came, I would tell you. I would tell you if she came. If we came here, he would punish us. He would punish us if we came here. If I were rich, I would go to London. I would go to London if I were rich. If he had realized that, he would have run away. He would have run away if he had realized that. If she had invited me, I would have come. I would have come if she had invited me. If I was / were offered a job, I would take it. If Mr. Dale was / were to apply for the post he’d probably get it. If I were you I would marry her. If you want to know English, you have to learn. If only he comes in time. =We hope he will come in time. If only he will talk to her. =We hope he will be willing to talk to her. If only he didn’t drive so fast. = We wish he didn’t drive so fast. We are sorry he drives so fast. If only it would stop raining ! If only somebody would smile ! You do not speak Thai. She does not play football. Is she a teacher ? เธอเป็นครูใช้หรือไม่ ? Are you hungry ? คุณหิวหรือไม่ ? Do you love me ? คุณรักฉันหรือไม่ ? Does she like coffee ? เธอชอบดื่มกาแฟหรือไม่ ? The doctor lets me live in a small room behind his house. He never lets her leave home. She lets me use her telephone. 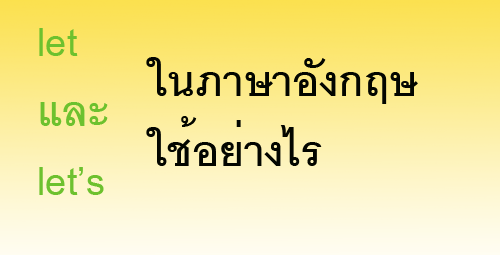 ห้ามใช้: She lets me to use her telephone. I let Viroj lead the way. She had let me leave without suspicioun. Because I was tired, I went home. I was worried because Thanonq was late. Why didn’t you come to my party ? Because I was busy that day. She loves me because of my money. I was late because of the traffic jam. I came home early because of my wife. Prime Minister Chavalit’s visit was postponed because of the heavy rain in the South. Have you ever been there before ? I realised that I had ever been there before. before, every thing was changed. I saw Somchai six weeks ago. How long ago was it, when you arrived ? She went a few minutes ago. I wrote many books before I went to India. หรือ : Before I went to India, I wrote many books. I will tell you before you leave. Please put out all lights before leaving the office. She wanted as much sugar as posible. We need as many books as possible. She needs as many boyfriends as possible. She drank so much as she wanted. Can I take these chairs ? Yes, you can take as many as you like. She spent ten hours to walk across the desert. She is trying to jump across / over the canal. Our house is just over / across the road. The boys are trying to climb over the wall. She walked through the wood. She walked through the crowd of people to the bar. It was wonderful to hear my mother talking about my father. I have to write about that. I have about 100 baht. My friend is writing a book about Thai philosophy. …. a Thai story about a king who has fifty sons. We are about to have supper. They all sat round the table. We walked round the old part of Bangkok. Can I look round ? They were running around / about everywhere. Stop walking around / about and do some work. There are around / about twenty students now. I have been here for around / about two years. Could you pass the cups round, please ? The students were running around/ about everywhere.